Change is the only constant in the world and business organizations know this all too well. With time, every small or large company needs to make certain changes to its policies, implement new strategies, restructure and so on. However, planning all these changes is one thing and implementing them is another. It takes lots of time and efforts to adopt and make new changes. Luckily, companies that are using Docsvault, find it easier to implement such changes. 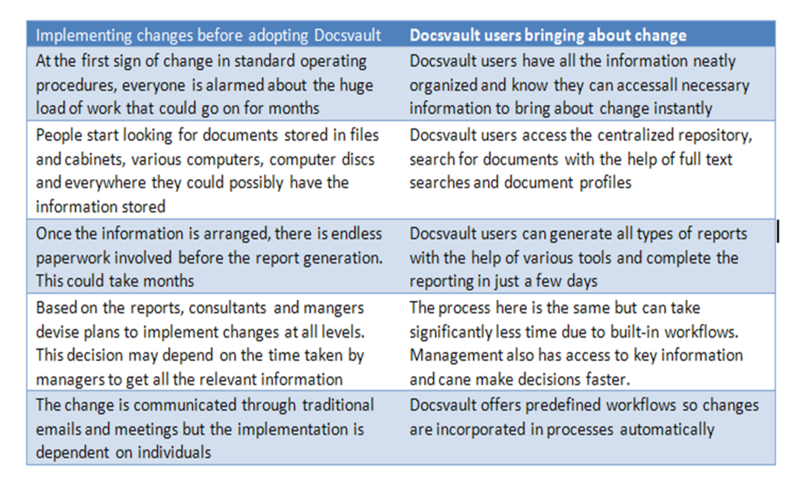 The table below clearly shows the difference in implementing changes before and after adopting Docsvault. As seen in the table above, change can be communicated, but it may not be understood and implemented using traditional methods. Docsvault offers many tools that improve communication and workflow which ensures that change is also implemented. In these competitive times, it is very important that changes are not only agreed upon but are also clearly understood and implemented. Technology makes it easier for people to adopt changes. Docsvault document management system organizes information and automated business processes so that all your internal change processes and strategies are implemented smoothly.